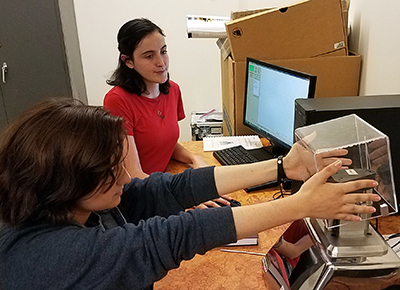 For the second year in a row, nanoHUB’s URE (Undergraduate Research Experience) program has included students from community colleges. 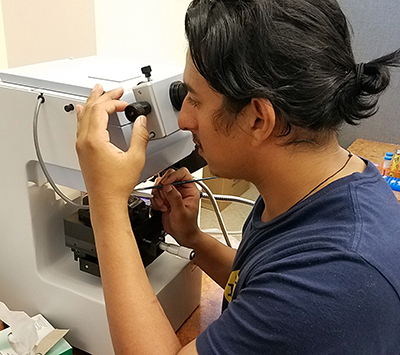 We spoke with Professor Marcial Gonzalez and his graduate assistant Caroline Baker, both from Purdue University, to learn more about the ways in which the students have been contributing to nanotechnology research via NCN’s cyberplatform. nanoHUB: Which school are you with? What is your research focus? Caroline: We are with the School of Mechanical Engineering. Our research focus, broadly, is the study of compacted powders at high confinement, as applied across energetics, pharmaceutical, ceramics, automotive, and other industries. nanoHUB: How many community college students are in the program, and from which community colleges are they coming? Caroline: There are four community college students in this program this year. Marcial: Three are coming from Pasadena City College in Pasadena, CA, and one is coming from Ivy Tech Community College of Indiana in West Lafayette. nanoHUB: How were they chosen? Marcial: Tanya Faltens, with the Network for Computational Nanotechnology (NCN) at Purdue University, is instrumental in identifying the best candidates for the NCN URE program. She has created a network of mentors in a number of community colleges who interview and nominate candidates. We then review these applications and prioritize, among other things, the student’s previous research experience, and plans to transfer to a 4-year school and ultimately attend grad school. nanoHUB: On which research projects are the community college students working? How are they using nanoHUB to accomplish their goals? Marcial: The general theme of the research project is powder compaction, which is a manufacturing process used in many industries. The students are exposed to applications in the pharmaceutical and energy industries. For example, the solid oral tablets sold in the pharmacy are compacted powder blends, and many solid propellants are pressed nano-powders. The performance of these products is controlled by their microstructure, which is formed during the compaction process. This summer, the students have three main goals: (i) explore the use of the nanoHUB tool Powder Compaction to simulate the fabrication process, (ii) fabricate compacts using a variety of different powder blends and characterize their properties, (iii) calibrate and validate the predictions of the simulations. nanoHUB: What will they be contributing to nanoHUB? Marcial: The main contributions are to the nanoHUB tool Powder Compaction. The students will create a detailed protocol for generating experimental data, calibrating the model and validating its predictions. 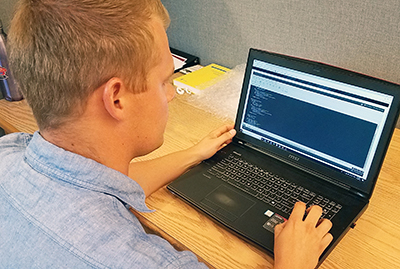 The students will also add a new feature to the compaction model that will allow the nanoHUB tool to better describe the unloading part of the compaction process. nanoHUB: Can you tell me, in a general sense, what your experience has been like so far in working with the community college students? Caroline: I have found the community college students to be very willing to learn and to ask questions in a way I don’t always see with traditional students. Marcial: My experience has been very positive. The students are well prepared and very open-minded, which immediately translates into being flexible and able to enter an unknown situation, quickly learn about it, and succeed at the task at hand. All community college students so far have had previous research experience and have presented their work in conferences. nanoHUB: What are the benefits that you see in encouraging community college students to participate in a research experience like this one? Marcial: I believe this is a great opportunity for community college students to be exposed to different scales and scopes of research, as well as to a large and interdisciplinary 4-year university. They will then develop a sense of what research means. By having a successful summer research experience outside their comfort zone, they will increase their self-efficacy. And, perhaps my most desirable outcome: they will acknowledge that they can go achieve goals such as transferring to a 4-year school or attending grad school. On a more technical front, they will increase their knowledge of computational simulations and nanotechnology. nanoHUB: Is there anything else that you’d like to share? Marcial: I find the experience very rewarding on a personal level too. Most community college students work while in school; I worked a full-time job during my entire college studies, so I relate to them. I understand the effort and sacrifices they make on a daily basis, and I hope this summer experience opens new doors for them on a personal and professional level.